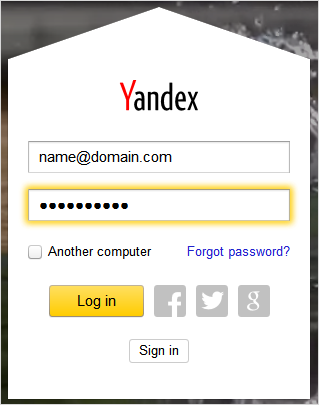 If you have Mail for domain, you can access Yandex.Disk by using your email address instead of logging in. To begin using Yandex.Disk, sign in on the service page. You will then be able to manage files on Yandex.Disk using the “Yandex.Disk” app. Attention. Yandex.Mail for Domain users that registered after October 10, 2016 can't edit documents. Mail for domain users are required to use a bank card when purchasing additional space. If you cannot log into Yandex.Disk with your account details, it is possible that your account has been removed from the domain or modified by the domain administrator. Contact your domain administrator to restore your account. If it is not possible to restore your account and you have paid for additional space on Yandex.Disk, please contact us using the feedback form to add the space you paid for to a different account.